Peterborough's Innovation Cluster is launching a Graduate Program for alumni of Fleming College and Trent University. Graduates hired by Innovation Cluster startups will now be provided free office space in order to further employment opportunities. The Graduate Program was created in partnership between the Innovation Cluster, Fleming College and Trent University as an incentive that promotes the growth of entrepreneurship, employment and student opportunities in Peterborough. The launched program promotes startup companies located in The Cube incubator to hire locally through Fleming College and Trent University alumni, to increase both employment rates for Peterborough’s educational institutions as well as reduce cost for incubated startups. Currently, startup founders pay a monthly fee of $100 per desk space per employee. This is still the case, however those with current employees who are Trent and Fleming graduates will not incur a fee for desk space, along with future alumni employees hired. Founders accepted into the program through the application process receive complimentary space to ensure that money is put to good use. Multiple companies within the Cluster who have grown their team by hiring local graduates have been able to reach new milestones with the aid from their employees. Andrew Revoy is a Trent University graduate and Senior Project Manager of startup company Kavtek, a client of the Innovation Cluster. Within four months of launching, Kavtek rapidly grew their team to keep up with the growth of their company, hiring software and project positions including Revoy, who says Trent University helped prepare for his employment. PtboCanada's Chalk Talk is a snapshot of people's favourite thing about Peterborough. Watch for us around town as we would like to feature your favourite thing too! 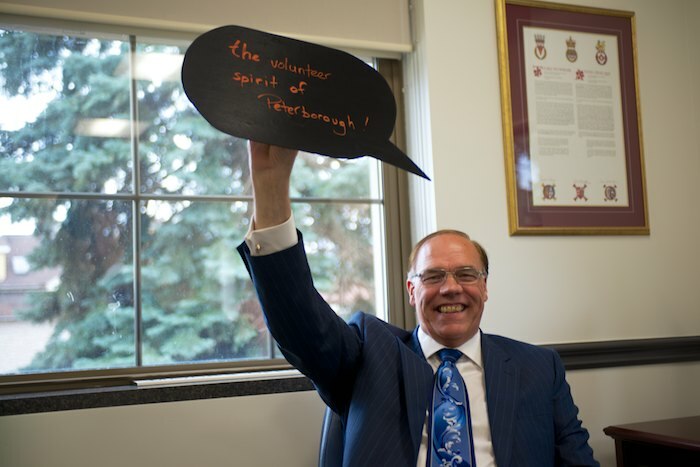 In this edition of Chalk Talk, Mayor Daryl Bennett was very enthusiastic about "The volunteer spirit of Peterborough!" Saying goodbye to 38º restaurant means welcoming Nicolini's back after a hiatus away from downtown. 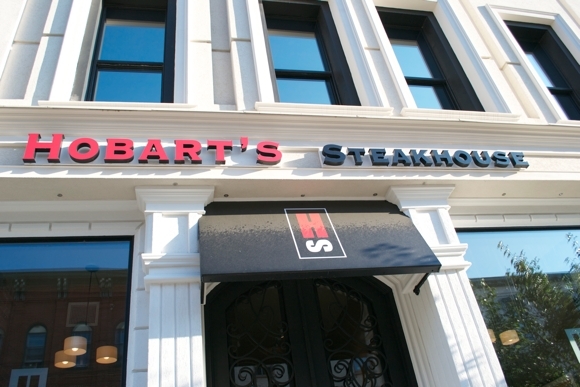 Hobart's Steakhouse is now calling Hunter Street home after a complete renovation to the building which was once occupied by Nicolini's. Across the road from Hobart's is currently the home of Fab Collectables & Gifts (see below), which is now on the move and has a 30% off sale in effect. No mention of where their new location might be. As we previously mentioned in a post, Circus has now opened its second location at 382 George Street to accompany their already existing location on Aylmer Street. Circus replaces Glow Maternity, which has relocated to 188 Hunter Street. Enticing Cakes will be moving across the road from their current spot to help expand and grow their bake shop. Also in East City is the recent addition of the already ever popular Ashburnham Ale House. 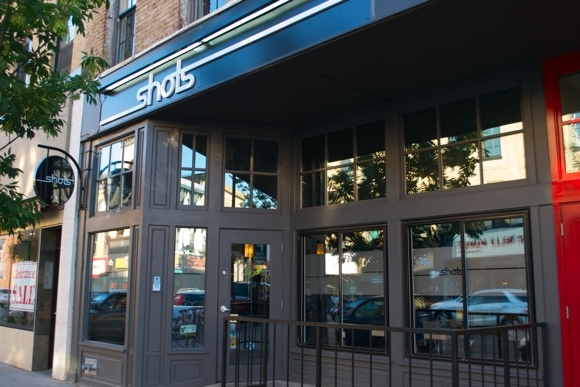 Shots (above) has recently opened in the old Splice location at 379 George Street. Goddard's Flippin' Burgers will be opening soon beside the Galaxy Cinemas where Johnny Eh's were previously located, and joining the increasing competition of the perfect burger downtown. Goddard's also has a location in Bancroft at 181 Hastings Street North (see below). We love to see new and existing entrepreneurs opening their doors and helping to continue to making our downtown a thriving one. Tip us with further changes you know about downtown, in East City and elsewhere around town. I come this morning wearing two hats. In helping to protect and grow the downtown. To speak at a DBIA Breakfast Network meeting. I would be happy to be part of it. In permitting me some leeway in selecting my topic today. At the half way point in our four-year term. With both reason and caution. Speaks to the state of the City’s financial well being. And that is the topic I want to discuss with you today. Are facing very difficult financial challenges these days. And the financial instability associated with the Arab Spring movement. Of course, municipal governments are not exempt. We have some legitimate concerns. Of the Ministry of Health and Long Term Care. And meet our future needs. And one in which I take a personal interest. And I want to answer that question for you today. Will be held to a zero per cent increase. There are five performance measures that I will quickly cover. Of our financial security and trustworthiness. That we have earned consistently since 2008. And a financial status that we can be proud of. Are consistently strong and robust. Or more than eight times our estimated debt service for 2013. This means that we have a very strong liquidity level. Again ... an accomplishment in which we can take pride. Is residential property tax increases. In order to help keep costs down for Peterborough families. And how they impact real people with real pocket books. To help fund much needed capital investments. And a course that we will continue for the entire term. To invest in our long term future. Because that can be a popular way to govern. But all of them are essential for our long term health as a City. Representing an investment of almost $63 Million. And a large number of road improvements. And all of them help strengthen a City that cares about its downtown. In managing the level of our capital debt. And the Fairhaven Long Term Care Home. Over the last three years of its calculation. The City is using less than half of its debt capacity. And still be within the limit imposed by the Province. We are still using only 75 per cent of our debt capacity. Has been managed responsibly and with caution. And we are living well within our means. Is an important part of our own financial picture. Of the total provincial budget. Of the provincial and federal governments. The City of Peterborough is in excellent financial shape. Our credit rating is positive and stable. Have been held to modest levels. Our debt situation is responsible and manageable. Who are the real engines of Ontario’s growth. Is a solid record of well managed municipal finances. And in our collective accomplishments to date. Watch: Pilot Episode For New Peterborough Comic Web Series "Jobless"
With the unemployment rate in Peterborough hovering around a miserable 12 percent, a timely new comic YouTube series has been launched called Jobless. Created by Mike Moring and Adam Martignetti, and showcasing local actors filmed at locations throughout the city, the plotline is this: Two clueless/utterly unemployable twentysomething dudes strive to make ends meet by any means necessary in Peterborough. Brilliant concept. Now this series has great potential on many levels—at the very least, it shines another light on the huge problem we have in the community with young people finding any jobs—and who knows, could totally take off and create a few jobs/source of income in the entertainment industry. Watch the first episode of Jobless below; it's fun, self-deprecating stuff. No Casino In The City is a new website looking to bring the latest information about the potential casino that is coming to Peterborough, and the possible negative impacts on the community. They have created a fact sheet, offer .PDF petitions to download, share upcoming dates of key meetings, and give info on what you can do to share your thoughts with others about the harmful effects of having a casino in town.